This past weekend I was lucky enough to attend THE Festival in Portland, ME. 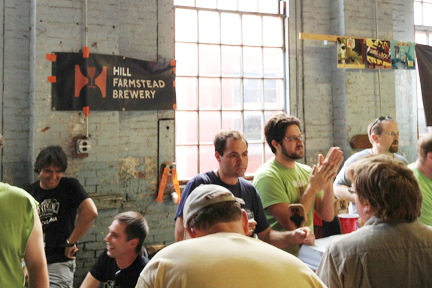 The two day brewfest was organized by The Shelton Brothers and Twelve Percent Imports, showcasing some of the most rare and sought after beers in the world, along with the master brewers themselves. 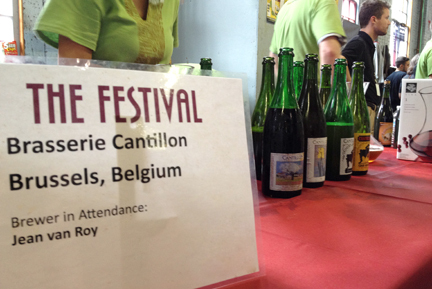 Guests included (but not limited to) Brasserie Cantillon, De Ranke, Drie Fonteinen, Tilquin, De Struise, Mikkeller, and Westvleteren, incredible New England breweries Hill Farmstead, Allagash, Maine Beer Co, and Oxbow, as well as countless others. 1. “Kriek” Drie Fonteinen (Belgium): Incredible Belgian sour. Dark pink color, intense funky nose, cherry flavor is “all up in your grill” yet balanced at the same time. 2. “The Green Dragon” Against The Grain (Kentucky, US): This was crazy intense yet smooth at 12.5% ABV. Classic, chewy barleywine with a boatload of New Zealand hops added to lend it a lemon creme finish. I came back to this table multiple times. 3. “Surette Riserva-Aged in Peach Whisky Barrels” Crooked Stave (Colorado, US): A farmhouse ale aged in peach whiskey barrels. Boom! Nuff’ Said. 4. “Flora” Hill Farmstead (Vermont, US): A wheat saison aged in wine barrels with local bacteria. This brewery can do no wrong in my opinion. Everything they make is a work of art and this brew is no exception. Light, floral, and tart. An excellent summer sipper. 5. “El Cedro” Jester King (Texas, US): A farmhouse ale copiously hopped and aged in cedar with Brettanomyces. This was my first experience with Jester King and I was thoroughly impressed with their selection. All very creative and boundary breaking brews. El Cedro had a little bit of everything going on - barnyard funk, piney resinous hops and a distinct dry finish that can only be achieved from cedar aging. They also had a gin barrel aged nordic beer that was BIZARRE but very tasty! 6. “Pilot Pale Ale” Maine Beer Co. (Maine, US): A new pale ale brewed solely with Simcoe and Citra hops. Light, crisp malt bill, with a unique “juicy” tropical fruit finish. A-mazing. For you Chicagoans, it is very reminiscent of Half Acre’s “Taco Day”. 7. “Agamemnon” Omnipollo (Sweden): An imperial stout brewed with maple syrup. Smooth, creamy, maple-y goodness. Definitely one of the best maple beers I’ve had yet. 8. “Okie” Prairie Artisan Ales (Oklahoma, US): An imperial brown ale aged in bourbon barrels. Yikes...this was delicious, as was ALL of their offerings which is why it was so hard to pick the best. Okie was everything you’d want from the style and more. A robust, chocolate malt bomb with a smooth vanilla/toffee finish from the bourbon. GREAT beers from a GREAT new brewery. 9. “Mexican Cake” Westbrook Brewing Co. (South Carolina, US): An imperial stout brewed with cacao nibs, cinnamon sticks, vanilla beans, and habanero peppers. I’ve had some chile pepper beers before but this definitely takes the cake (hehe). A velvety smooth mouthfeel that leads into dark chocolate and spices that swirl on the palate. I was worried about the habanero, but its subtle and complements all of the other flavors. Definitely something I would search for in the future. 10. “Trappist Westvleteren XII” Brouwerij Westvleteren (Belgium): Hands down, BEST belgian quad I have ever tried. Your taste buds are overwhelmed by layers, upon layers of dried figs, plums, and raisons, and for 10.2% abv, the finish is like silk. The part that blows my mind is that this table had no line the entire time! The volunteer actually looked bored. If this brew was easier to obtain I’d dedicate my life to it. 11. “Saison Framboise” Brasserie Trois Dames (Switzerland): A farmhouse ale brewed with raspberries. Very intense raspberry on the nose and on the palate, with a tart, funky finish. An extremely flavorful raspberry inspired brew. 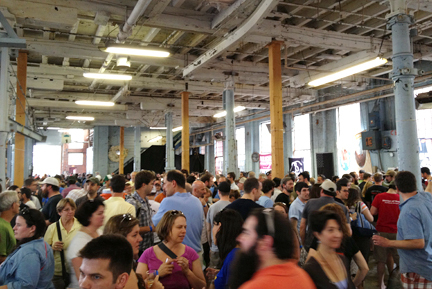 Trois Dames was the most underrated brewery at the festival. Their head brewer in attendance, Raphael Mettler, was so friendly and knowledgable it was hard not to stay and talk beer for the remainder of the afternoon. 12. “Ginger Libation” Green River Ambrosia Meadery (Massachusetts, US): Not really sure how to classify this meadery’s only “mead-less” offering. It’s basically a high gravity Kombucha, slightly sweetened with cane sugar, pineapple and citrus juice. It’s light, effervescent body gives way to a tart, fruity ginger-bomb. I could see how non-believers would misconstrue this as a girly drink, but at 9% abv I’d slap on a pink bikini and sip this all summer long.